Transfer by minibus to the border of Chiangkhong. Formalities to leave Thailand. Crossing the Mekong by motorboat. Formalities for entry into Laos. Welcome at the border by your local guide. Short visit of the town and its temple. After breakfast take a city tour. Transfer by road to reach Luang Namtha, quick tour of the city then head to Muangsing. During the way stops in many ethnic villages: H'mong, Akkha, Lamed, Kmu, Tai Deng and Lao Huay. Northern Laos is very mountainous and Muang Sing is one of the few habitable valleys. Many tribes live together, one beside the other. Today we discover Muang Sing. Stroll through the village, visit the Ethnic Museum, market, and temples. Road by minibus to Xieng Kok and Muang Long by unpaved road. Stop near several minority villages (Hmong, Yao-Mien Koh Pouly, Kui Sung). Meetings with Koh Tchitcho (still unknown ethnicity). Visit the village of Xieng Kok, a large village enjoying a splendid view over the river. With the border of Myanmar nearby, you will see Burmese people come to trade their goods. This small town is also an important port for Chinese vessels. Lunch at a local restaurant. After breakfast drive to Oudomxay. Various stops along the way to visit one governmental school, small villages, rice field. Visit the village of Oudomxay and around: market, Tay Dam village, temples. Transfer early morning towards Muangkhoa. Visit the beautiful village of Muang Khoa, where the Vietnamese come to trade with Laos and China. Going down the Nam Ou in a motorized long tail boat to Muang Ngoy, a small village beside the river. Short walk to meet the locals. A hike (2 to 3 hours walking time) is the best way to explore the authentic life of the habitants of three differents ethnics groups. A splendid view of the mountains and rice fields is offered to you. After the trekk, we will travel by boat to Nong Khiaw. After breakfast, we leave Luang Prabang for Phonsavanh by a mountainous and windy road with breathtaking views. Arrive in Phonsavanh in late afternoon and transfer to your hotel. Seeing the sights of the famous Plain of Jars, the hot springs of Muangkham, see life in villages and local markets. Back in the late afternoon. Visit of the city and the market. Departure for Vang Vieng on a spectacular mountain road. Departure to Vientiane, capital of the country. It always gives the impression of a colonial town with wide streets and houses in the French colonial style. Visit That Luang, the great golden stupa, shrine and national emblem of the city, Patuxay (arch), recently built to commemorate the dead during the war. Walk in the market loaded with magnificent embroidered fabrics. Downtown hotel near the Mekong. Vat Sisaket, the oldest temple in Vientiane with its mural paintings. Ho Prakeo, the royal temple turned religious museum. Garden of Buddhas and the fresh market Talat Hua Khoa. Welcome by your guide at Pakse airport, then transfer to the Tadlo, Bolovens Plateau. On the way, visit of differents minorities (Alak and Khatu)and walk in a coffee & tea plantation. Afternoon in Tadlo at a site in the beautiful riverside Sexet. Night in a guesthouse near the waterfalls. Direction Champasack with stops at Phasoum Tad, Tad Yeaung two wonderfull waterfalls. Travel further to the former royal capital Champasack with pre-Angkorian Wat Phou. The ruins date mainly back to the tenth and eleventh centuries, but the initial part dates back to the fifth century and occupies an imposing site. Superb carved lintels representing the gods Vishnu, Siva and Bramna are still intact. Boat trip to the Cambodian border to see the presence of rare and mysterious river dolphins. Walk on the widest part of the Mekong, in the middle of the islands Si Pan Don (4000 islands). Discovery of the Khone Phapeng Falls. They are the only impassable rapids forming an obstacle to navigation on the Mekong between the Chinese border and its delta in Vietnam. Sharing the calm and timeless life with the communities on the island, the lives of fishermen and farmers. 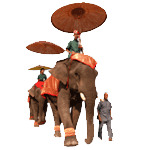 Stops in Phou Asa where you can ride on an elephant (around 1 hour ridding). Visit of Pakse, its old colonial houses, its local market, its temple. As a guide, the tour price otherwise Laos is $ 1927, based on 4 people in standard accommodations.